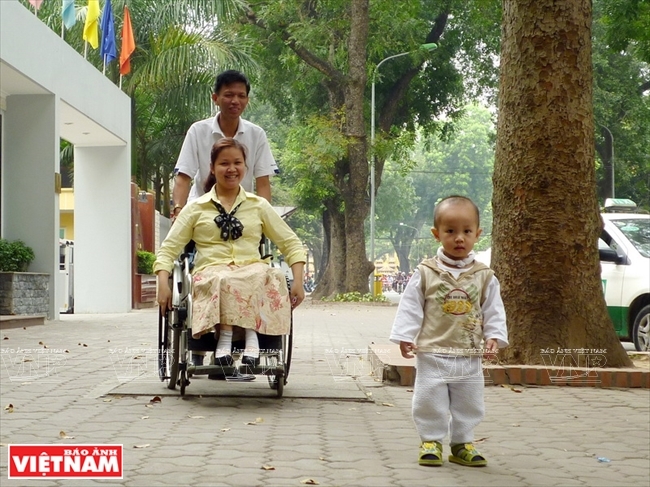 Suffering from hemiplegia caused by a brittle bone disease at birth, Lan Anh was luckily raised in a family which has a philosophy of living that everybody, in any circumstances, must try their best in order to receive true respect from society. Nguyen Thi Lan Anh, Director of the Action to the Community Development Centre (ACDC) at her office. Lan Anh (second from left) talks with experts from non-governmental organisations. Lan Anh poses with visitors to a business establishment of people with disabilities in Thai Binh province. 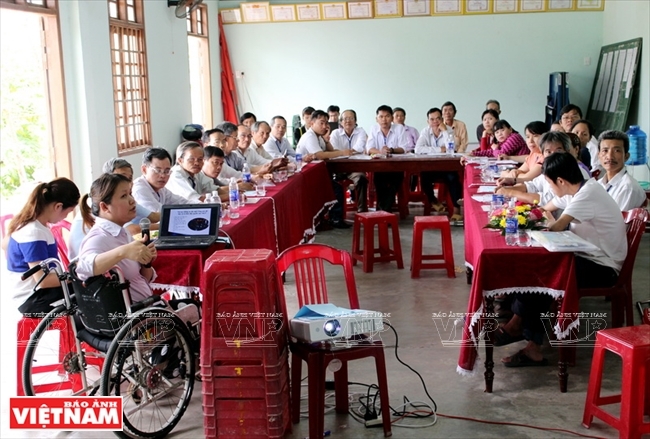 Lan Anh (white shirt) in a counseling session on occupational skills for people with disabilities. Inspired by her parents, Lan Anh strongly believes that barriers actually lie in one’s mind rather than in his or her body. She has thus overcome psychological barriers to achieve outstanding performances in her education since she was a little schoolgirl. 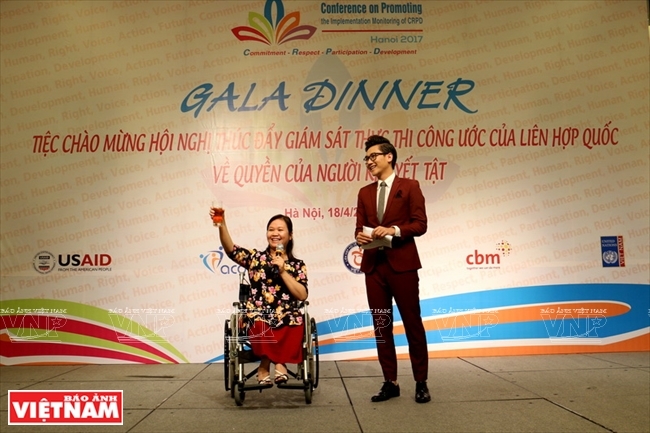 More than ten years ago, she was among a few students with disabilities to pass the entrance exam to enter the Hanoi College of Foreign Languages and graduated in 2004 with a BA degree of distinction. In 2010, she got an MBA at Hanoi National University. Explaining her achievements which are hard to gain even for an ordinary person, Lan Anh pointed out that a person with disabilities will have to try ten or even twenty times harder than an ordinary person because people with disabilities do not have many opportunities. “The only way to grasp chances life has given to you is that you should never give up even in the most difficult times,” she said. Whenever the weather changes, Lan Anh suffers terrible pain and cannot get out of bed. But with a strong will and extraordinary energy, this woman does not allow herself to surrender to her illness. Because she deeply understands the difficulties and challenges people with disabilities have to endure, Lan Anh has set up the Action to the Community Development Centre (ACDC) with a strong desire to help this disadvantaged community. It took many years and much energy for Lan Anh and the other founders of ACDC to build trust in donors and partners because “they do not believe people with disabilities can make it,” she recalled. ACDC has changed the awareness and thinking of many people in society about people with disabilities through quite new approaches which are based on the rights and abilities of people with disabilities rather than on the mercy and charity of other people. 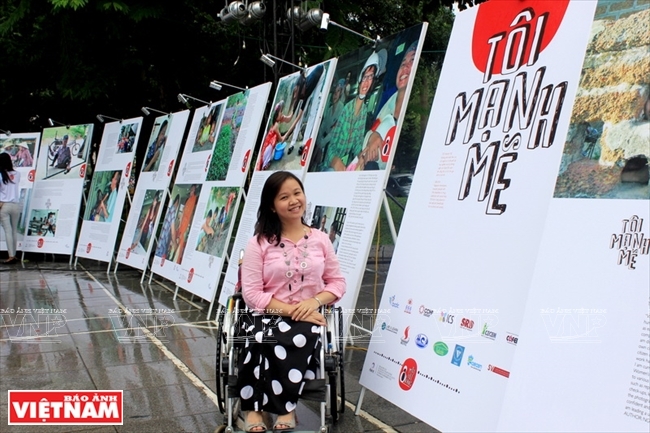 What people with disabilities need is social respect and integration as well as empowerment, not material support such as a wheelchair or a pair of crutches, Lan Anh stressed. ACDC has helped people with disabilities learn and have access to their rights through projects to provide free legal counseling, occupational training and life skills and policies for people with disabilities. These projects have created chances to make friends and share life experiences with people in the same circumstances, helping build confidence for them to integrate into the community and work more effectively. Lan Anh (pink shirt) cuts the ribbon to open a photo exhibition entitled “Mot toi khac” (Another me). 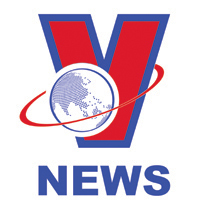 In 2013, Lan Anh received the Female Vision Award of the Hanoi International Women’s Club (HIWC). 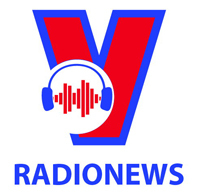 This is an annual award given to a woman with a vision, who through her own efforts, has changed an idea into reality. At the 2013 Female Vision Award ceremony, HIWC Chairwoman Paulina Pineda said: “To realise a dream, one needs imagination, a strong will, courage and confidence and Lan Anh possesses all these qualities. Personally, Lan Anh has helped me learn that barriers lie in our mind rather in our body. Her example makes us wonder about our role and contributions to this world”. Lan Anh’s success is not merely a story of energy but of awareness. Her example not only lights up trust in the abilities of people with disabilities but changes the thinking about them as Lan Anh believes, “barriers lie in our mind rather in our body”.